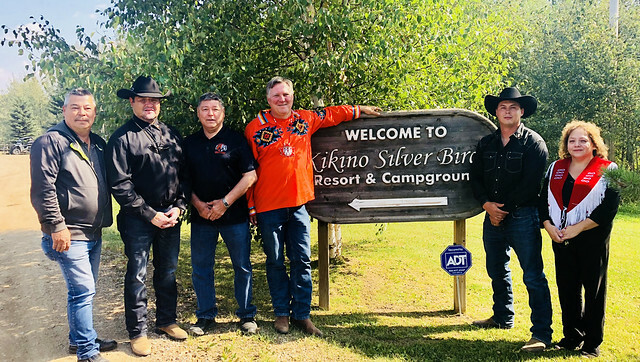 Kikino Metis Settlement has been able to make much-needed upgrades to its Silver Birch Resort and Campground thanks to an Alberta government grant. Minister Feehan joins members of the Kikino Metis Settlement to celebrate upgrades to the Kikino Silver Birch Resort and Campground. The funding is designed to spur on economic growth in the community. The grant has allowed the resort to modernize its services, including establishing online booking capabilities, providing power to 69 campsites, upgrading 10 cabins, adding a shower house and building a new playground. The $700,000 grant was provided through the Aboriginal Business Investment Fund, which provides funding to eligible Indigenous community-owned businesses and organizations to support economic development and improve social outcomes for Indigenous peoples in Alberta. The fund has provided $15 million since 2015. The project has provided more than 12,700 hours of work for eight part-time workers from the settlement. It will also increase economic opportunities for the community and the region. Construction activity and incremental annual sales will add approximately $4 million to the local economy in the first year and $870,000 on average for the next four years.